Last week, The September Project received a nice write-up in American Libraries, the magazine of the American Library Association (ALA). The article’s author, Greg Landgraf, did an excellent job highlighting the diversity of September Project events. To show the range of events, Landgraf mentions an academic library (O’Grady Library at Saint Martin’s University in Lacey, Washington), a public library (Goffstown Public Library in Goffstown, New Hampshire), and a school library (at Country Day School in Huntsville, Alabama). The article also spotlights the ALA’s own event, a reading of the Qur’an on its front steps on September 11. Getting folks together for difficult conversations and providing resources for people to learn more about their world is what The September Project is all about. 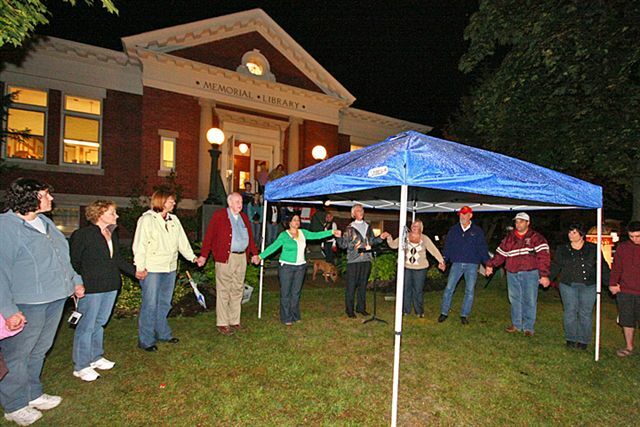 It is also what libraries – like Goffstown Public Library, pictured below – do every day. 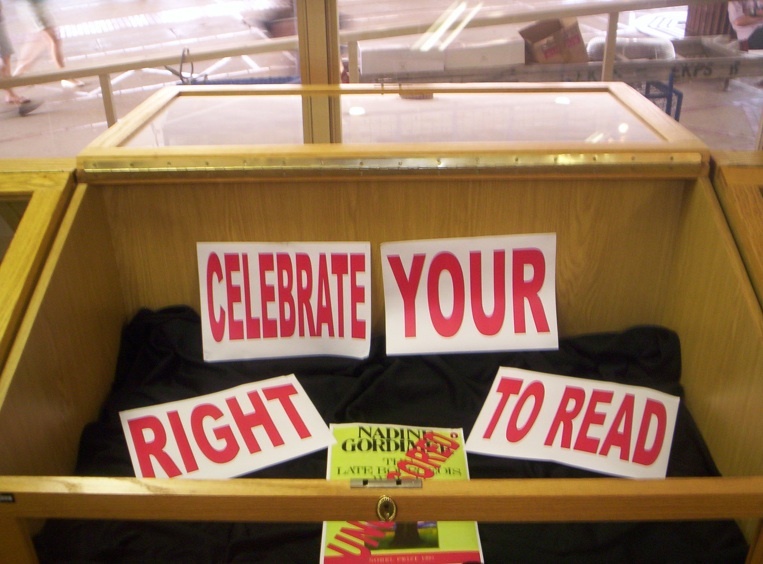 Celebrate the right to read and think freely! When: September 30, 9 a.m. through 5 p.m.
Who: UT faculty, staff, and Toledo area residents will give 20-minute presentations about the right to read and think freely. Edmund Lingan and Risa Beth Cohen will sing “Three Troubled Tunes” at 5:30 p.m.
A Digital Journalism class will explore the controversy surrounding the Olympia food co-op’s decision to boycott Israeli products (on a local scale) and issues surrounding the Israeli/Palestinian conflict (on a global scale). The Digital Journalism students will research the topic and create a slide show which will include 40-80 quotes, various sources and images, representing multiple perspectives on the issue. The slide show will run on the library wall monitors during a week in September. This slide show will also be made available online. david and i would like to know your thoughts on the future of the september project. if you have participated in the project, please consider completing a short survey. we’d love to hear from you. thanks! Rather late than never, I would like to tell you about the Library of the University of Pretoria’s September Project. September is heritage month in South Africa, and a good opportunity to celebrate our freedom, in particular our freedom of expression. We decided to do an exhibition of books that were banned during the Apartheid era, and encourage students to read the once banned books. Supported by our literature information specialist, Adrienne Warricker, one of our assistants, Niel de Kock, hunted down these previously banned books in our collection. This task was unexpectedly more difficult than we anticipated because these books were now completely integrated into the collection, when they were previously in a separate special collection. 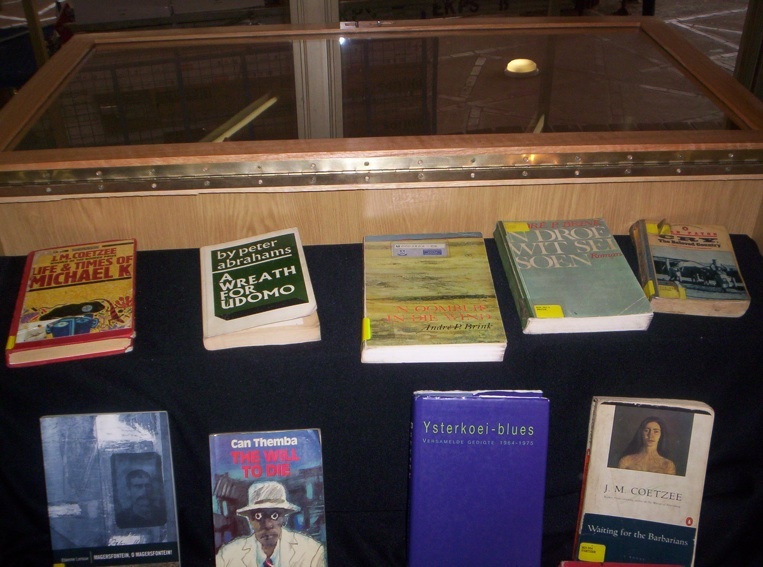 We also found many of the previously banned books were not in our collection, exactly because they were banned, and libraries had to have special motivations to acquire them during the Apartheid era. Many more is now out of print. 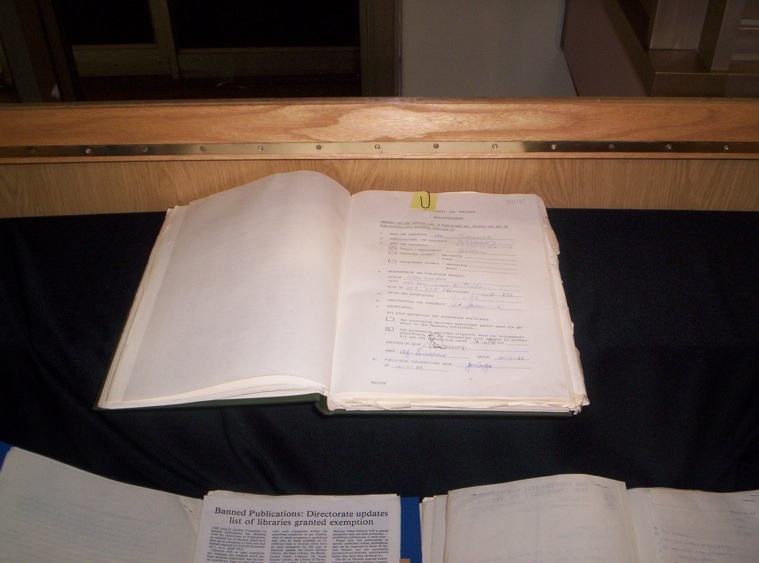 We also called in the help of our colleague in Special Collections, where the previously banned books were housed before their integration into the open collection. He explained what the process and procedures were around access to these books. We thank Pieter van der Merwe for his contribution. On the 17th of September we had our exhibition in the main library. I include some photos of the exhibition. Niel de Kock also compiled a presentation which we ran on the plasma screens in the Library on that day and subsequently during September. TSP event update: Just got some exciting news from Esperanza Sanchez in Argentina! Sabrina Díaz is a visual artist, who graduated from the Visual Art School of Lomas de Zamora in Buenos Aires. 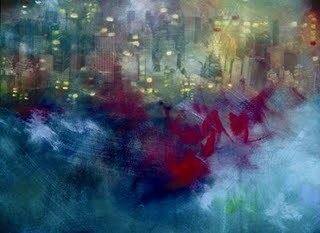 She Specialized in Photography, Digital Art and Painting. At the moment, she is the manager of the Visual Ideas Department, in the Cooperation Cultural Center Floreal Gorini. Sabrina has been producing and exhibiting her art since 2003. In the fog of memories, Sabrina Díaz builds her universe. Her visible topic: New York City. Its buildings, its parks, its skies. As flashes are fixed in remembrance, this reality will later become a route full of sensation and experience. Just like in her previous exhibition in 2007, the artist mixes different procedures: digitally intervened pictures, acrylic painting, watercolor pencils applied on canvas or on paper (providing different chromatic effects). The limits between digital and film pictures are no longer clear. She is producing works in which the general climate goes beyond any technique. New York, the visible subject, becomes a dream, the place where Sabrina Díaz reveals her interior world with an intense poetic dimension.